At Copier Chicago we understand that never everyone has the same needs. We have experience setting up every kind of business you can imagine with an amazing workplace machine. There are still many people that don’t trust signing themselves up to a leasing company no matter how good their reputation is. Luckily, we offer the option of buying a used copier and not having to be stuck working with a leasing company or years to come. 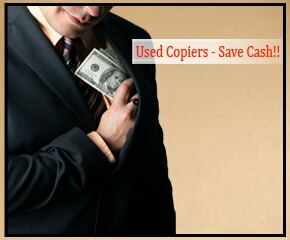 Buying a used copier is a great solution for many businesses. There are lot of people who do not want to be stuck with another monthly payment that they have to worry about. It is more expensive up front to buy a copier, but you get freedom and you will save money in the long run over the cost of a long lease. Used copiers can often still be maintained if the parts are still in circulation, and many leasing companies are totally find with creating a service agreement, even if you are not leasing through them. This means that you can still get great service from Copier Chicago, even without having the have a monthly lease. Our used copiers are in amazing condition. We make sure that all our used copiers are in working order, so you can get to work sooner. We also offer return policies on used copiers to help make sure you aren’t stuck with a lemon. So call us today at Copier Chicago to get set up with the perfect copier for an amazing price.